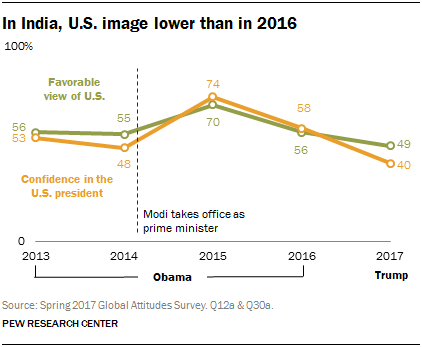 Amid steep declines in the image of the U.S. around the world, Indians remain relatively positive on America and its president. Roughly half (49%) have a favorable view of the U.S., while just 9% have an unfavorable view. Four-in-ten have confidence in President Donald Trump to do the right thing regarding world affairs, and only 16% do not trust him on the world stage. Still, this year’s ratings for the U.S. and its president are lower than in previous years. In the last year of President Barack Obama’s administration, solid majorities held a favorable opinion of the U.S. (56%) and trusted Obama’s approach to international affairs (58%). Obama and Modi forged a close relationship during Obama’s tenure that was exemplified by their frequent visits, including Obama’s 2015 trip to India for Republic Day. Roughly half of BJP supporters (52%) are positive on the U.S., but only 36% of Congress party supporters agree. Congress backers, however, are more likely to express no opinion of the U.S. There is a similar pattern on confidence in Trump, with BJP supporters slightly more likely to say they trust the U.S. president on the world stage (44% vs. 33%) and Congress supporters more likely to offer no opinion. When asked about Trump’s personal characteristics, nearly half of Indian adults voiced no view. But among Indians who had an opinion, most said that Trump is a strong leader (42% overall) and well-qualified to be president (41%). Indians were split on whether the new American president is dangerous, arrogant and someone who cares about ordinary people. On balance, those responding to the question tend to believe Trump is neither charismatic (29% vs. 22%) nor intolerant (32% vs. 17%). When it comes to Trump’s policies, much of the Indian public offers no opinion. However, more Indians approve than disapprove of Trump’s plan to restrict immigration from select majority-Muslim countries (37% vs. 24%). BJP supporters (41%) are more likely than Congress backers (22%) to favor this policy. There is also more approval than disapproval for a U.S. withdrawal from international climate change agreements (32% vs. 25%). (The survey was conducted before the Trump administration announced the U.S. was pulling out of the Paris climate accord.) Those who express an opinion on the U.S. withdrawing support for the Iran nuclear deal, building a wall on the Mexican border and pulling American support for international trade agreements tend to be divided on these issues. Indians voice mixed opinions of other global powers and Asian counterparts. Longtime rival Pakistan receives extremely negative marks in India – 72% have an unfavorable view of their northwestern neighbor. While a smaller share (41%) dislikes China, negative views outrank positive by 15 percentage points, reflecting the increasingly tense relationship between the world’s most populous countries. Russia fares about as well as the U.S., with 47% of Indians saying they see Russia in a positive light, and a slightly smaller share (42%) expresses warmth toward Japan, notwithstanding recent efforts by New Delhi and Tokyo to deepen economic ties. Though the U.S. has lost some ground in India, it remains much more popular than China. Just 26% of the Indian public holds a positive view of Beijing compared with the 49% who see the U.S. in a favorable light. About four-in-ten (42%) believe the American government respects the personal freedoms of its people, but just 25% say the same about the Chinese government. A plurality of Indians (42%) believe the U.S. is the world’s leading economic power, a 9-percentage-point drop from last year. However, unlike people in many other nations around the world, Indians do not see China gaining ground on this measure: Only 11% of Indians see China as the world’s top economy, a sentiment that is virtually unchanged since 2016. While Indians are relatively confident in Trump’s international leadership, those who express an opinion on Chinese President Xi Jinping’s handling of foreign affairs are split. Only 21% express confidence in Xi while a similar 23% have no confidence. A majority (56%) offer no opinion of Xi’s capacity to do the right thing on the world stage. Many Indians see China’s increasing power as a zero-sum game. Even before this summer’s military standoff on the Indian-Chinese border in Doklam, a 56% majority in India said China’s growing military power is bad for India. A similar 51% believe China’s growing economy, with which India runs a trade deficit, does not bode well for their country. Roughly two-thirds (66%) of Indians believe ISIS poses a major threat to their country, easily outstripping concern about all other international issues tested. Indian concerns about the Islamic militant group are up 14 percentage points since 2016. During the survey fielding period this spring, ISIS carried out its first attack in India, injuring 10 train passengers in Madhya Pradesh. About half of Indians feel very threatened by global climate change, while slightly fewer name China’s power and influence and cyberattacks from other countries as major threats. About a third believe the large number of refugees leaving countries such as Iraq and Syria and the condition of the global economy are large concerns. Relatively few people in India voice the view that American and Russian power are major threats to their country. In fact, 19% say U.S. power and influence pose no threat at all and 25% feel the same way about Russia, although more than a third express no opinion. By contrast, another key U.S. ally in the region – Japan – has starkly different views of the threat posed by Russia and the U.S. Roughly six-in-ten (62%) in Japan see American power as a major threat, while about four-in-ten (43%) feel this way about Russia. While Indians have consistently given Pakistan negative ratings in Pew Research Center surveys, the extent of their disapproval has intensified in 2017. More than six-in-ten (64%) in India have a very unfavorable view of Pakistan today, up from 55% last year. Disdain for Pakistan cuts across party lines – BJP and Congress party supporters express similar levels of negativity for India’s longtime foreign rival (70% vs. 63% very unfavorable). However, those living in southern India, far from the India-Pakistan border, are decidedly less negative about Pakistan. Only 36% of those living in the south express a very unfavorable opinion of Pakistan, compared with 68% in the east, 69% in the north and 77% in the west. And in southern India 30% have a favorable view of Pakistan, versus just 6% in the north and east and 3% in the west. When it comes to dealing with the disputed border regions of Jammu and Kashmir, the Indian public favors an aggressive stance. A 63% majority believes the government should be using more military force. Few say India should use less force or even the same amount as it is using now.